A lot of us shy away from making things like angel food cake or meringues, because if you’re only using the egg whites, what do you do with the leftover yolks? You have to find another recipe just to use up the yolks. I agree, I much prefer to make something that uses whole eggs. But, there are times when you just have to try out a new flavour of macarons, right? After making pavlova, I was left with 8 egg yolks. I considered making an egg yolk sponge cake, but then I came across this recipe and just couldn’t resist. I love simple “everyday” cakes that aren’t overly sweet, but are still tasty enough to be eaten on their own, cakes that you can eat any time of the day – for breakfast, mid-morning snack, afternoon tea or even a light dessert. 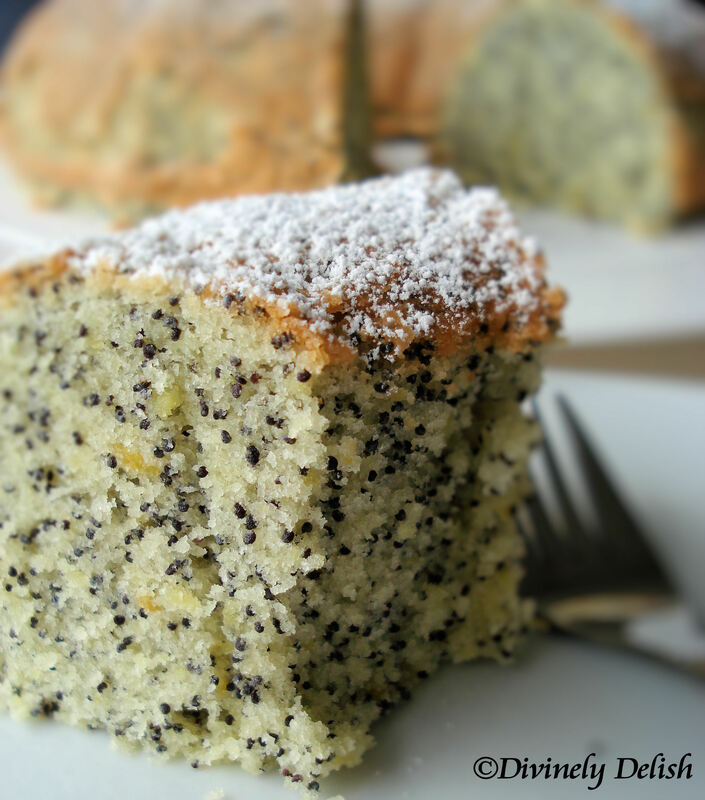 The poppy seeds add a wonderful nutty flavour and slight crunch to this zesty lemon cake. 1) Preheat the oven to 325F. Generously butter and flour an 8-inch fluted Bundt or tube pan. Butter the dull side of a 10-inch piece of foil. 2) In the bowl of an electric mixer fitted with the whisk, beat the sugar with the egg yolks and whole egg at medium-high speed until the mixture is pale yellow and very fluffy, about 8 minutes. 3) Beat in the lemon zest. 4) Sift the flour, cornstarch and salt over the egg mixture and, fold in using a rubber spatula. 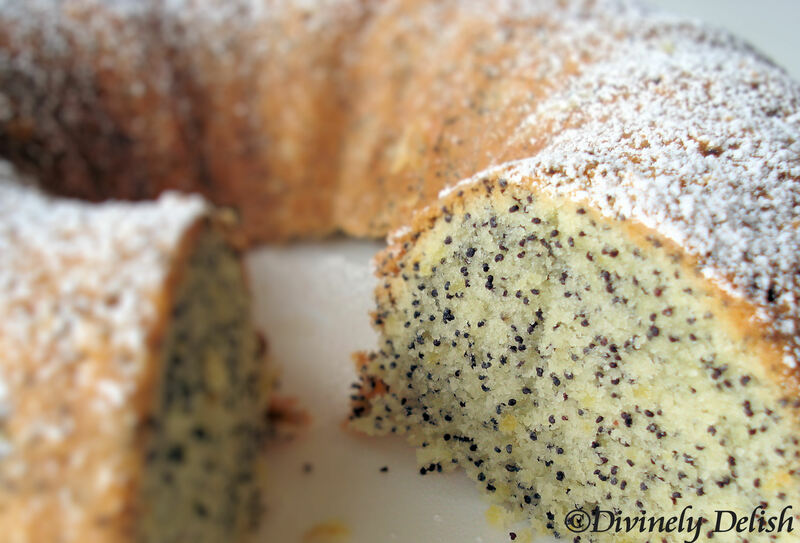 5) At medium speed, beat in the butter, then beat in the poppy seeds. 6) Pour the batter into the prepared pan and cover tightly with the buttered foil. 7) Bake for 45 minutes, or until the cake pulls away from the side of the pan and a cake tester inserted in the centre of the cake comes out clean. 8) Remove the foil and let the cake cool in the pan, on a rack for 15 minutes. 9) Invert the cake onto the rack and let cool completely before serving, at least 30 minutes. Do ahead: The cake can be wrapped in plastic and foil and left at room temperature for up to 3 days. hi. was jus wondering why the use of foil? The foil helps prevent the top from getting too brown and ensures the cake cooks more evenly. By sealing tightly with a foil, the steam is trapped and helps keep the cake moist.